This lock was at the junction of the Somersetshire Coal Canal with the Kennet and Avon Canal. 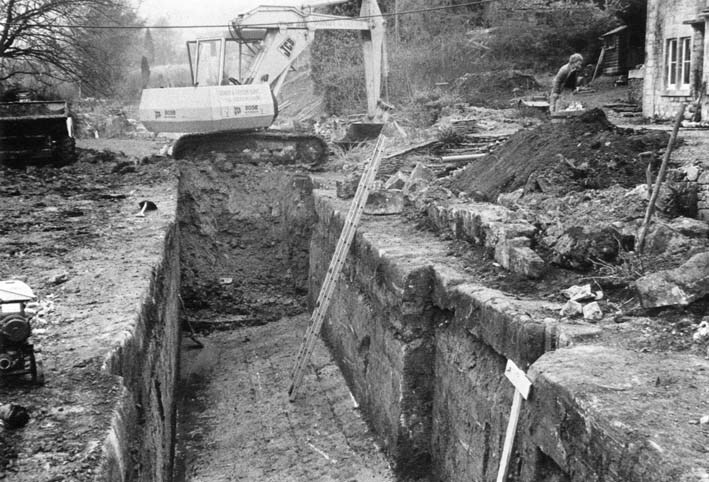 Both canal companies had gone to considerable expense to aquire water for their canals and they were not willing to let this valuable commodity flow freely from one canal to the other. Although the level of the S.C.C. was only a few inches higher than the level of the K&A, this lock was installed to separate the canals. There is only one gate at each end of this lock - which is unusual for the S.C.C. All the other locks on the canal have a single top gate and double bottom gates; this is because a single bottom gate, which is much deeper than the top gate, would be heavy to operate. Furthermore, it would need more space in which to swing open, making the lock chamber longer and wasting more water. It is thought that the main reason for this lock having single gates is that, when it was rebuilt from a double lock with double gates, only one gate of each pair was retained. Because the difference in water level between the two canals is so slight, only a trivial amount of water is lost despite the extra length taken up by having a single bottom gate. Unusuallly, this lock has a third gate, which is in the middle of the chamber and swings the opposite way from the other two. This was a 'stop' gate' which would be swung shut by rapid movement of the water from the K&A if the S.C.C. became breached and its level suddenly dropped. During excavation only half the lock 'invert' (floor) was found, the other half is presumed to be underneath the filled-in part.